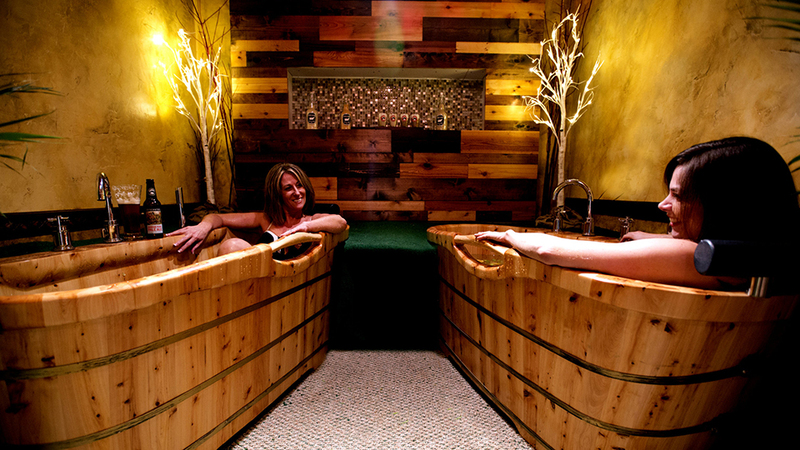 Hop in the Spa is America’s first beer spa and it’s only natural that such a destination would come about in beer-loving Central Oregon. Beer spas are all the rage in Europe, as Sisters resident Mike Boyle discovered on a business trip. Upon returning, he pitched the idea to Sally Champa, a Sisters-based naturopath practitioner and herbalist, and Hop in the Spa was born. A beer spa might conjure up images of soaking in a bathtub full of brew, but the process is much more refined and restorative than that. Hop in the Spa offers three different Microbrew Soaks, each featuring hops, herbs, minerals, and other proprietary ingredients. These ingredients, along with variable water temperatures, provide a relaxing therapeutic treatment unlike any other in the world. Lean back in your personal solid cedar soaking tub and take in the serene surroundings and completely unique experience. You can also add a muscle-relaxing massage to your soak for the ultimate pampering. And each treatment comes with a Bavarian-style pretzel to enjoy along with a fresh pint from local brewing powerhouse, Deschutes Brewery. Located on Cascade Avenue in Sisters, Hop in the Spa offers a thoroughly intoxicating spa experience Tuesdays through Thursdays by appointment only, Fridays and Saturdays from 10:00 a.m. to 5:00 p.m. and Sundays from 11:00 a.m. to 4:00 p.m.